Please visit our fabulous sponsor this week, Crafty Sentiments Designs, to see all of their wonderful products! 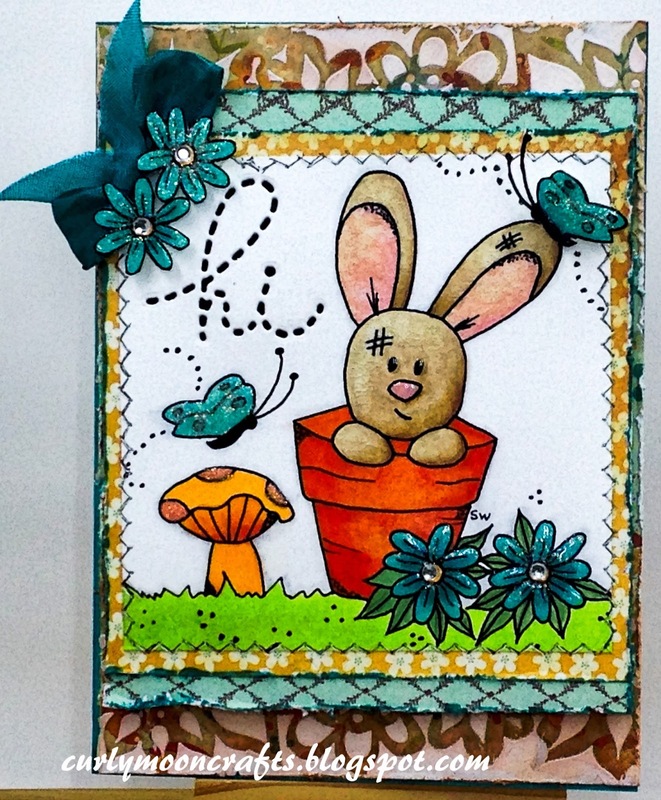 My creation for this week is a mixed media card using the Toby In Pot digital stamp. I printed the digital image onto PRISM white cardstock, and colored it with Copic Markers (see below). I used colors to match the MME Stella & Rose papers that I selected for the background. 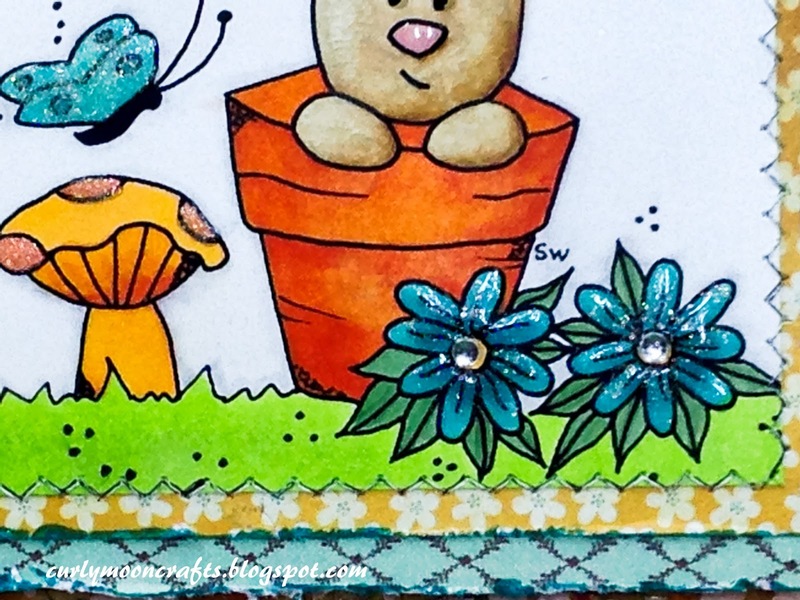 I printed another image and colored the flowers & butterfly and fussy-cut them for accents. I wanted more texture on the butterflies, mushroom and flowers, so I added Glossy Accents and ultra-fine glitter to them. 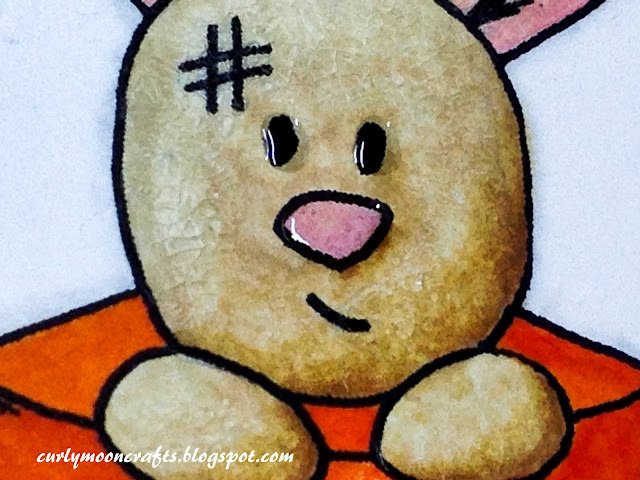 For Toby, I used colorless blender and a cloth to create some dimension, but decided that I wanted a bit more, so I painted the Distress Collage Crazing medium over him, then added Glossy Accents to his nose and eyes. I used a die to cut the word "hi" into the panel, then backed it with black card-stock. I machine stitched the image panel to the first patterned layer, then added the accent flowers and butterfly with foam dots. 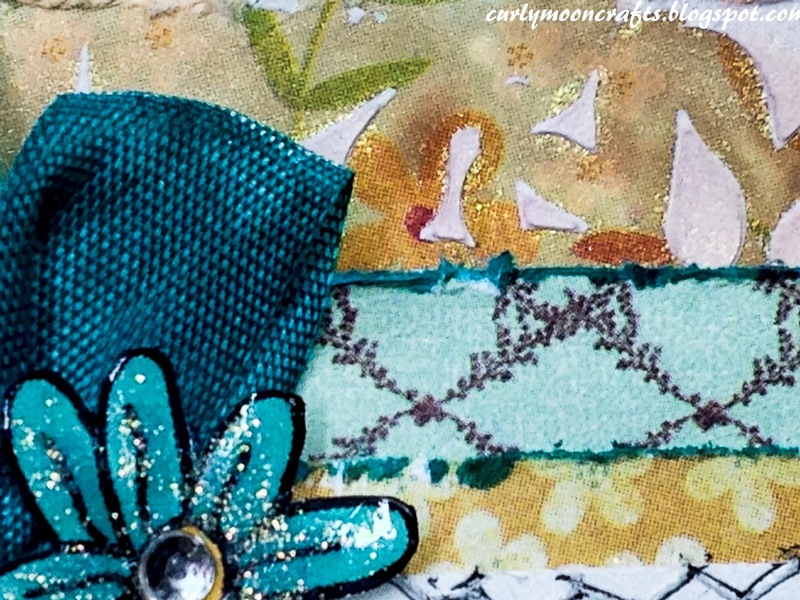 I backed this layer with another patterned paper layer and distressed the edges with my Prima distress tool. I have this Dylusions stencil that has flowers similar to the ones in the digital stamp, so I used the stencil and some modeling paste, colored with Rusty Hinge Distress Stain, to add some texture to the base layer of the card. Then I sprayed the area with Lindy's Stamp Gang spray to add some additional color and shimmer, and distress the edges. I used a Copic Marker to edge my card base, attached the embossed panel, then added the image panels with foam dots. To finish, I colored a bit of Crinkle Ribbon with my Copic marker and attached it under the accent flowers. Other items from my stash: ultra-fine clear glitter, foam dots, black card-stock, white card base.